The ambulance isn't on the road today, and needs repairs which will costs hundreds of pounds. An East Midlands Ambulance spokesperson said: "One day it could be you or your family member who needs our emergency help." Ambulance paramedics are calling for tougher sentences in court to deal with people who attack them. They say more defendants should be sent to jail as a deterrent. Only this week a woman escaped with a small fine after punching an ambulance worker twice as he was trying to help her injured son. Keith Wilkinson reports. 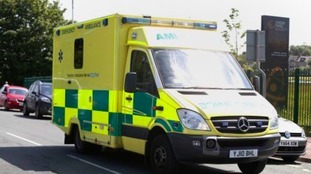 East Midlands Ambulance say they have seen a surge in the number of 999, urgent and emergency calls over the past 24 hours, many in connection with symptoms caused by the warm humid weather. On an average day they take around 2000 calls, but yesterday they received around 3000 calls. Types of calls included sunstroke, dehydration, heat exhaustion and breathing difficulties. They have also seen an increase in the number of road traffic collisions. The ambulance service in the West Midlands is preparing for one of its busiest nights of the year. Controllers are expecting hundreds of extra calls tonight as people are out for the New Year. Emma Burrows has been to the control centre near Dudley ahead of tonight's celebrations. East Midlands Ambulance Service has missed a target for reaching patients in time for the third consecutive year. Ambulances are supposed to respond to an emergency call within 19 minutes, 95% of the time. Last year EMAS only achieved 91.8% – they've been fined £3.5m. Dr David Gray from East Midlands Ambulance Services says an investment in staff and vehicles should raise the percentage. The Health Scrutiny Committee for Lincolnshire is to write to the Secretary of State to ask for East Midlands Ambulance Service’s (EMAS) “flawed” consultation to be reviewed – with the committee’s ultimate goal being a return to a dedicated ambulance service for the county. Meanwhile, the members also quizzed the United Lincolnshire Hospitals Trust (ULHT) on its death rate figures being higher than expected and received a number of reassurances. The decision to write to the Government was made at its meeting yesterday (March 20), after the committee expressed concerns over EMAS’ recent consultation process and its ambulance response times. An inquest is to take place into the death of a 75-year-old woman who died when the ambulance she was travelling in crashed. The accident happened in the early hours of Monday morning. The patient, from Sutton-on-Sea, was travelling in the ambulance along the A16 when it left the road and ended up in a ditch near Boston. Two male ambulance service staff were taken to hospital and treated for minor injuries. An investigation has begun after an elderly patient travelling in an ambulance died after it went off the road, and crashed into a ditch in Lincolnshire. It happened in the early hours of this morning in Sibsey near Boston. Although the ambulance was on its way to hospital, it didn't have it's emergency sirens or lights on at the time.